Get CactusVPN for Up to 54% Less This Easter! Update! April 3, 2018. This promotion has ended. There’s no better way of guaranteeing your online security than investing in CactusVPN. And with our one-off Easter discount, the highest levels of privacy have never been more affordable. CactusVPN provides our clients with some of the most secure encryption technologies around. Our service lets you ensure that your privacy and security are guaranteed, and lets you sidestep geo-restrictions to access global content. 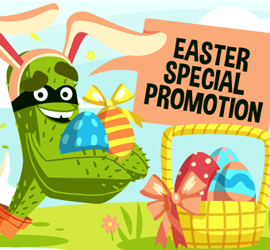 And thanks to our Easter discount, subscribing to CactusVPN has never been easier.